Understanding how and where you're accruing costs in the cloud can be a challenge. Keeping costs down can be even more difficult, without the right tools. 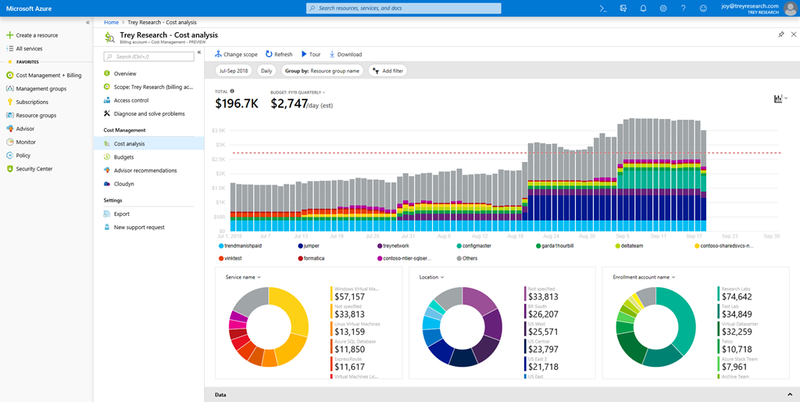 Azure Cost Management, now in preview, can help. View enrollment, management group, subscription, and resource group costs over time against a predefined budget. Analyze daily cost patterns to identify and stop spending anomalies. Break costs down by tags, resource group, service, location, and more—to focus on what's most important. Create subscription and resource group budgets to set soft limits on usage and costs, and get notified as important thresholds are approached. Set up automation with action groups to trigger custom events and enforce hard limits on your terms.